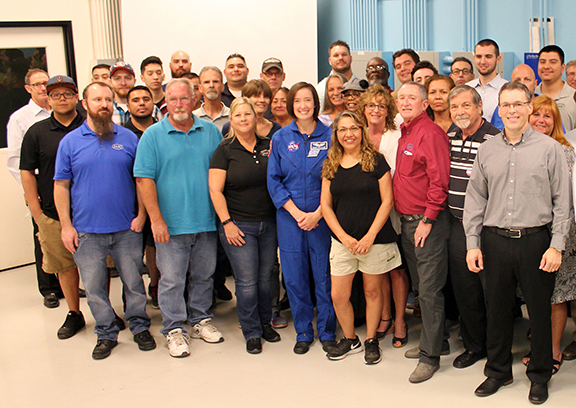 On Tuesday, November 8 NASA astronaut Megan McArthur visited JASC in conjunction with our work on the CST-100 Starliner space capsule system. 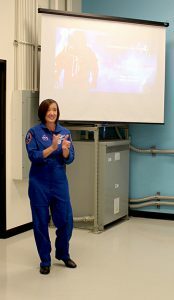 She gave an informative presentation on her career as an astronaut and the future on human spaceflight. McArthur holds an aerospace engineering degree from UCLA and a Ph.D. in oceanography from UC-San Diego. She was selected as an astronaut in 2000 and in 2009 served as a mission specialist aboard Space Shuttle Atlantis on STS-125, the final repair mission to the Hubble Telescope. Currently, she provides support to crews in training and those aboard the International Space Station as deputy chief of the astronaut office ISS Operations Branch. JASC is proud to be partnered with Aerojet-Rocketdyne (AR) in supplying critical valves to support the CST-100 Crew Capsule Service Module (CCSM) program. JASC is supplying the main valves found in the Service Module Pressure Panel. This panel takes stored high-pressure helium gas and regulates the pressure to the fuel and oxidizer tanks. JASC valves are used in all three propulsion subsystems: the Reaction Control thrusters (RCS), the Orbital Maneuvering and Control system (OMAC) and the Launch Abort Engines (LAE). JASC looks forward to supporting the CST-100 program on many future flights. Located in Tempe, AZ, JASC is an engineering solutions provider for the aerospace, space, and gas turbine industries.